This Painted World can be accessed by visiting the Cleansing Chapel in the Cathedral of the Deep and speaking with Slave Knight Gael near the bonfire. 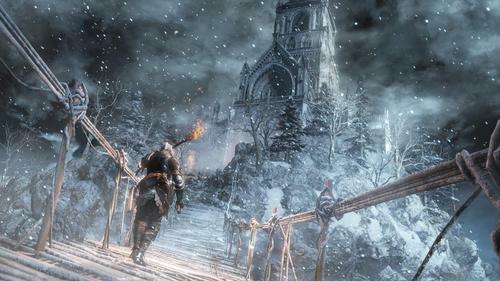 The Painted World of Ariandel is comprised of the Snowfield, Rope Bridge Cave, and Ariandel Chapel. When you first arrive, a friendly NPC introduces the area, ""Ahh, have you just arrived? How very unusual. Just how long has it been! Rejoice, my new friend! For this is a true haven of the Forlorn. The cold and gentle painted world of Ariandel. Quick, go along, find one for yourself. A sweetly, rotting bed to lie upon… Ahh, ahh, yes, of course. You're no exception. We've all seen terrible things. But you're safe now. Let it ease your burden. Ariandel will make a fine home for you. So, go on ahead, find one for yourself. A sweetly, rotting bed to lie upon…"
One of the spells left behind by the young sorcerer Sulyvahn before leaving the Painted World. Imbues right-hand weapon with frost. Sulyvahn was born and raised inside the painting yet had little use for his frigid homeland, since he had not yet experienced loss.